Congrats to Shannon for winning Giada's Cookbook Giveaway! Thank you to all who participated. Remember the fish tacos I was telling you about last week? Well, here they are! Fresh Wahoo straight from the sea. The family and I get extremely excited when a friend of the family catches more than he can eat. Wahoo is a mild white, firm fish and you thank your lucky stars if you can get a hold of some. My brother-in-law first introduced me to these fried fish tacos when I was about 12 years old. At that time, I was still in my bread and cheese phase and the thought of eating fish was too crazy and foreign for anyone to even think about bringing up. But he raved and raved about how much I was missing, because when Fresh Wahoo is eaten within a couple days of catching it doesn't even taste like fish. I eventually nibbled off a piece and was forever changed! My plain picky diet from then on tapered off and I was able to expand my food horizon and try new things. So, I have him to thank for giving me that extra push because I can't imaging not being able to eat these delicious tacos that I smothered with Mango Salsa and Lemon Pepper Guacamole. 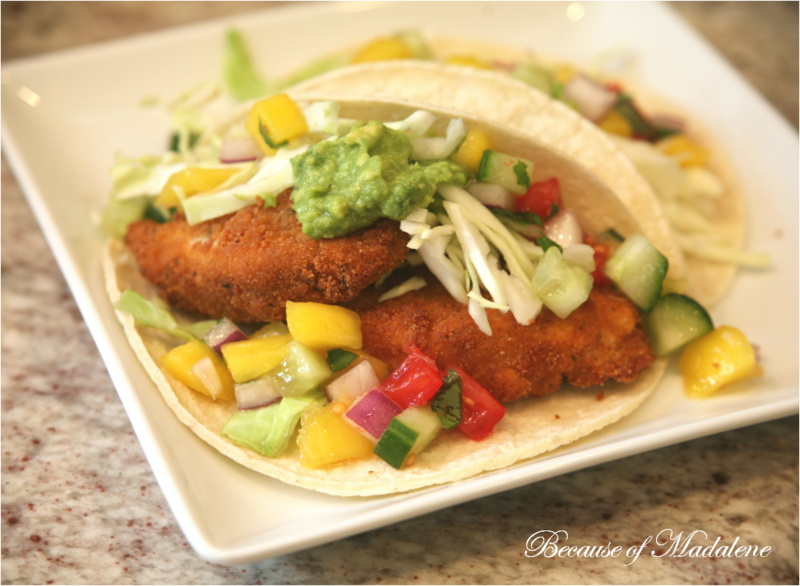 Sweet, tangy and super filling, these tacos are a must try for you and your kids! Set up your breading station. One plate with side walls... ex. pie plate, will be filled with the eggs (mixed together), one pie plate with the flour and a third pie plate with the bread crumbs. Dip the fish into the eggs, then place into the flour. Firmly pat down so the flour sticks. Then transfer into the bread crumbs. Firmly pat the fish into the bread crumbs for a good coating. In a frying pan, fill with 1" of canola oil. Once the oil gets hot, fry the fish on high heat, until the bread crumbs are golden brown (about 5 mins). Serve in a flour or corn tortilla with all the fixings... cabbage, mango salsa and guacamole!